Fair Transport is the world's foremost sail cargo company. 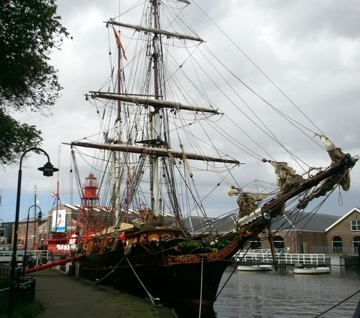 Its 32-meter ship, the Tres Hombres, has pulled off many a voyage in the past few years to bring rum, cacao and other goods from the Caribbean to northern Europe. Shorter runs have involved France, the UK, Denmark, and the Netherlands. 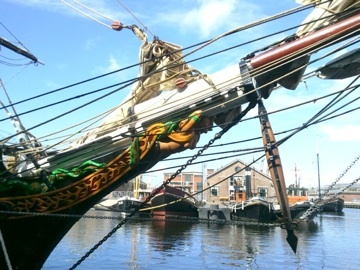 The solid, strong brigantine vessel's home is Den Helder, the naval/ship-building/museum port first envisioned by Napoleon. Now the ship is bound for Copenhagen where a visionary buyer will capitalize on the "green" market for carbon-emission-free wine. 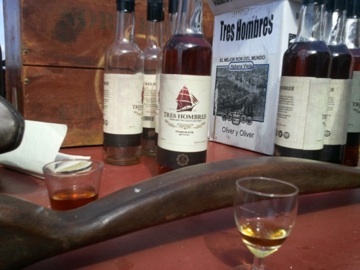 Not only does this wine consist of varieties of organic Bretagne vintages; it was brought to the dock in Brest by horse and cart. Now I get to help on the high seas to deliver the wine and unload it (what's left of it!). 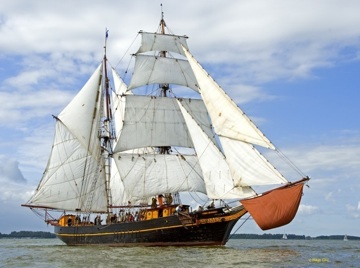 The Tres Hombres is engineless, thus greenhouse-gas free. Yet it gets where it needs to go, hauling up to 35 tons of non-perishable goods as well as passenger-trainees to assist the crew. To be viable Fair Transport needs to keep up its momentum with more shipments and passenger-trainees. We sail this Monday with five empty berths. You could have signed on! it's my pleasure to help sail the boat, strum a few tunes, and spread the word of successful sail transport. (Please pass it along.) There's the next voyage for you to support from afar, if you can't come along and be at sea for weeks. The future of trade and travel will not be based on dwindling, ever-more-costly petroleum. The atmosphere cannot stand today's vast quantities of catastrophically polluting bunker fuel and jet fuel. And the beauty of the ocean, crossing it peacefully with traditional skills (plus modern navigation technolgy), with the satisfaction of energy-efficient, non-polluting transport, are all here now. In comparison, the vaunted techno-fix for maintaining the industrial consumer economy depends on ever more manufacturing and investment; in short, growth and collateral damage known as climate destruction. In the case of the Tres Hombres -- named for the founders, Arjen, Andreas and Jorne -- the fixer-upper hull was already available. A fast but safe design from 1930s Germany, the oak and douglas fir hull was gotten for very low cost by the three "hombres" [Tres Hombres = three men, in Spanish] with a vision of traditional completion via community investment. Shareholders cheer on the voyages and hope for the movement to spread. No less than three hundred volunteers had a hand in bringing the Tres Hombres to life as a functioning, able ship. In the accompanying photo of Tres Hombres on which I stood amidships, I'm looking aft at wind generators and solar panels on davits. 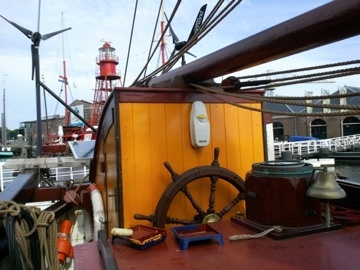 In the background there is an historic lightship, part of the Den Helder harbor's Willemsoord Museum Dock complex. We all appreciate consuming nice goods, and we expect a reliable supply. With awareness required today, we not only need to buy wisely (organic, fair trade, shade grown, sail transported) but must also take the extra steps to support visionary projects and movements. It's time to live the future now. Crew members and trainees of the Tres Hombres know this as they arrive by train and bicycle -- the most popular modes of land transportation in Holland. 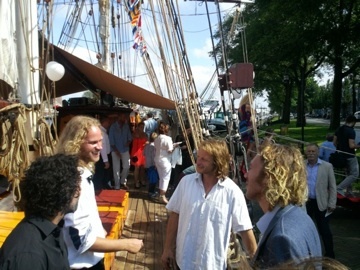 Check out FairTransport.eu, and on SailTransportNetwork.com watch Hombre Jorne eloquently discuss sail transport in his TED talk (scroll down several stories). Photographs by Jan Lundberg except where noted.